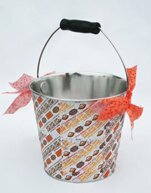 These cute candy buckets are easy to make and fun for all. 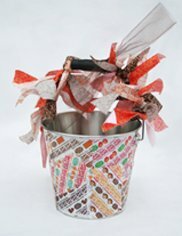 You can use just about any type of candy wrapper and color combination, be creative! 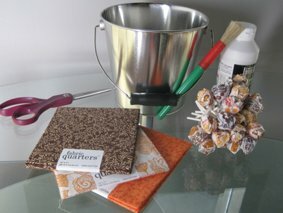 Apply decoupage glue to the bucket using a foam paint brush, then apply the Dum Dums lollipop wrappers any way you like. You can try placing the wrappers in a repeating pattern like stripes, or put them on in a "patchwork" pattern for something a little easier. Once you have the wrappers on and smoothed out, coat the wrappers with more glue, then wait to dry. This is definitely an easy craft that you will enjoy making with your kids. Editor's Note: Since Lisa submitted this wonderful craft article we've noticed several different decorating options on the Internet for candy wrapper baskets and buckets. Color combinations include multi-color pastel Dum Dum wrappers with pastel ribbons (cute for Easter), red buckets with tootsie roll wrappers and red/brown ribbons (Christmas), and Reese's Peanut Butter Cups wrappers -my favorite! Copyright © 2012 by Lisa Davala on Behalf of Spangler Candy. All rights reserved.